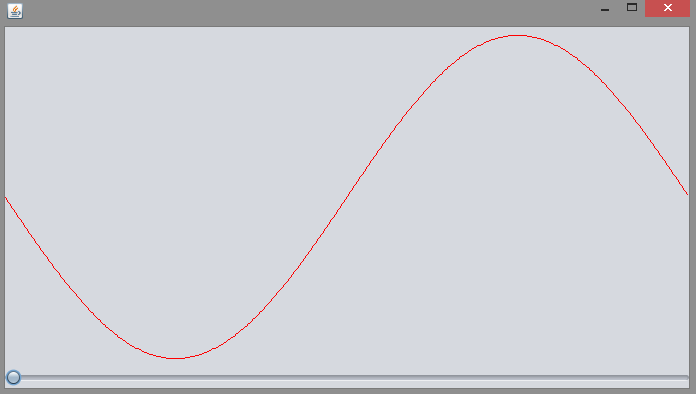 Drawing a sine wave using Swing: The number of cycles is adjustable. Code Source: Thinking In Java 4th Edition. //the height (actual vertical coordinates calculated from sine values). These aren't used as some coordinates. by multiplying it with SCALEFACTOR is becomes 200 cycles in this case. the upper curve isn't drawn. After the first half, negative sin values begin. subtended by half the circle on the center = 180 Degrees. //radians = PI * 800 / 200 = PI * 4 = 180 degrees 4 times which gets you 2 complete cycles. //Nimbus look and feel. Looks nice to me.